Guests of all ages will be able to enjoy a variety of crafts, music, and other demonstrations throughout this 2018 season of events. 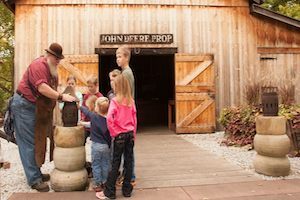 John Deere has announced that it will kick off its season of special events at the John Deere Historic Site on Sunday, June 24. It will begin with its annual Music and Crafting Through Time festival, formerly known as the June Jam. The event brings together local musicians and pioneer-era crafters who demonstrate and sell their creations. Those who attend will be able to learn more about basket weaving, wood carving, quilting, and a wide array of other crafts. Children are invited to take part in games such as hoop rolling and potato sack races. Food trucks will be on site throughout the day. "Our Music & Crafting Through Time Festival is a great opportunity to hear talented local musicians while being surrounded by the beautiful grounds of the John Deere Historic Site," said Kristen Veto, manager for the John Deere Historic Site. "In addition to enjoying a relaxing day of listening to music and learning about pioneering crafts, guests can also experience all that the Historic Site has to offer including demonstrations by our blacksmith and guided tours of John Deere's home." On August 4-5, the Hammer In event will take place, featuring blacksmiths from around the Midwest. The Grand Detour Art Festival is slated for September 9, and October 13 marks the beginning of Fall Festival. The John Deere Historic Site, located in Grand Detour, is open seasonally from March through December. More information on the event or the venue can be found by visiting www.VisitJohnDeere.com.